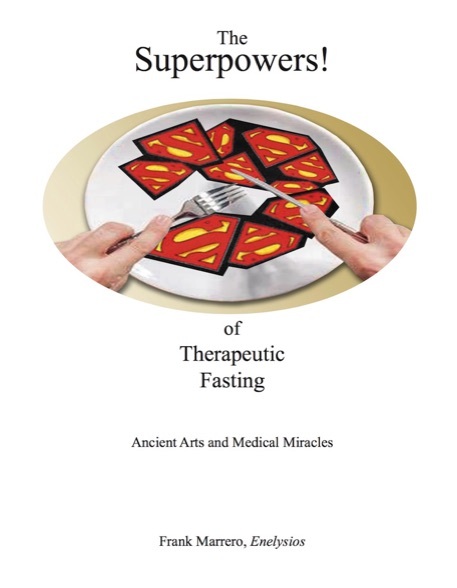 The latest medical research about fasting delivers an acuity of understanding and awe-filled scientific revelation like never before. No longer do we need to wonder about the bio-chemical and systemic effects associated with all modalities of fasting. No longer do we need to believe authorities who promote their provincial beliefs, limited interpretations, or personal agenda with regards to fasting: it’s science now, combined with our own informed and direct experience. We can simply listen to antecdotal advice and trail-blazers and winnow what makes sense to us. The end of authority begins with grounded understanding and our own responsibility. Fortunately, the research is clear—while ironically bordering on miraculous. Unfortunately, the most recent science is not easy to take in. This fact inspired me to attempt an explanation for the lastest findings. Everything else in this book is just a kind of “good company” surrounding and supporting the Words of the Day. This is not a “how to” book, even as there are bits of wisdom one may gather. If you are new to fasting (check with your doctor of course), you can take in The Idiot’s Guide to Fasting along with Michael Mosley’s “5-2” books (see The FastDiet - Revised & Updated: Lose Weight, Stay Healthy, and Live Longer with the Simple Secret of Intermittent Fasting), and wander around the myriad of www.fasting.com or the simpler www.allaboutfasting.com for starters. You will see, as the science clearly shows, that a myriad of fasts all have great benefit. With every kind and level of fasting, the corresponding depth of benefits can now be understood. The good news is that the most modest and easiest approaches have most of the benefits. Pick the kind of approach you think best, or experiment. They’re all great, for with each style you learn the dance of chosen hunger. When you can do that two-step on the dancefloor, superpowers begin. This is a news flash. Before dismissing fasting as something you can’t do, check out the latest science and how easy it can be. If you want it quick and effortless, invest 57 minutes and take in the BBC Documentary, “Eat, Fast, and Live Longer,” available for free outside the Queen’s domain. This documentary includes interviews with this book’s main living heroes, Dr. Victor D. Longo (Edna M. Jones Professor of Gerontology and the Biological Sciences at the USC Davis School of Gerontology and director of the USC Longevity Institute) and Mark P. Mattson (Director of the National Institute on Aging Intramural Research Program, National Institutes of Health, Department of Neuroscience, Johns Hopkins University School of Medicine). Having taken in the science, you can more easily navigate the challenges that superpowers require.